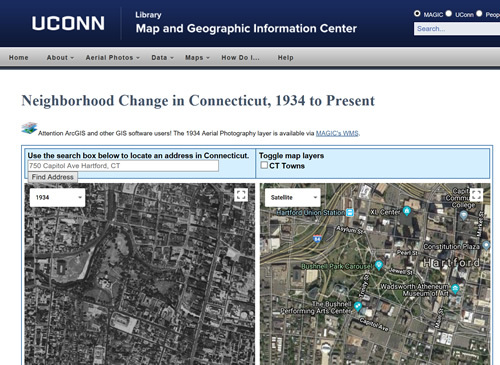 The University of Connecticut Library Map and Geographic Information Center - MAGIC, in collaboration with the Connecticut State Library, UConn Center for Land Use and Research (CLEAR), and the Connecticut Department of Energy and Environmental Protection are focused on digitizing and providing public access to aerial photography for the state of Connecticut. Included below are aerial photography collections which MAGIC, CT ECO, and the Connecticut State Library provide for the state of Connecticut. CT ECO is an interactive web mapping interface which allows users to view aerial photography mosaics and GIS data layers via the web. This interface allows users to generate customized maps for locations within Connecticut. CT ECO is a service provided by the Connecticut Department of Energy and Environmental Protection (CT DEEP) and UConn's Center for Land Use and Research (CLEAR). Interactive maps that include Elevation, Geology, Open Space, Soils, Water Resources, Watersheds and and more! MAGIC in collaboration with the Connecticut Department of Energy and Environmental Protection (CT DEEP) has developed a series of historical aerial photography indexes to assist users with locating aerial photography for an area of interest in Connecticut, Each of these aerial photography indexes can be viewed within GIS software, Google Earth, or users can locate an aerial photo by using the Map Preview link. Several of these aerial photography indexes also include direct links to a pdf and full-quality TIFF version of each photograph. 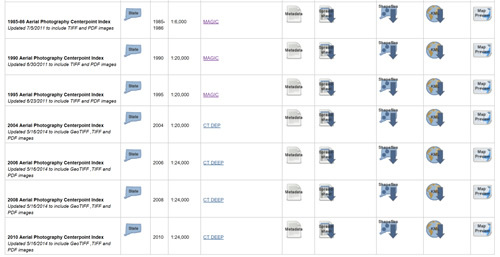 Included below is a listing of the Aerial Photography Indexes available from MAGIC. Note: To obtain digital images for 1969 once you have identified aerial photos you wish to use, just email us at MAGIC magic@uconn.edu with the photo number(s) and year(s) and we will send you a copy of the individual aerial photos. 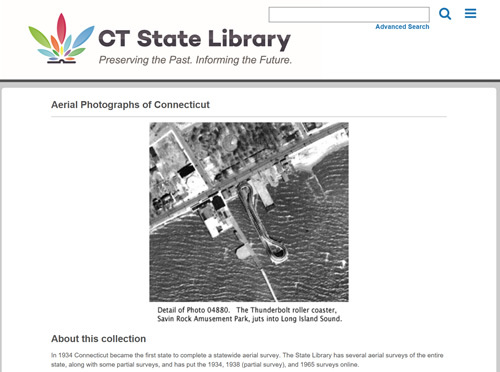 The Connecticut State Library (CSL) includes several aerial photography collections electronic and print formats. Included below is a brief outline of the aerial photography collections available from the Connecticut State Library. MAGIC has created a series of Aerial Photography Mosaic Map Mash-ups which enable users to view aerial photography mosaics, search for a particular location by street address, and view different years of aerial photography mosaics for a particular location. These maps utilize aerial photography imagery from CTECO's Map Services and MAGIC's Web Map Service (WMS) to create custom Google Maps Mash-ups to enhance the usability of these collections. 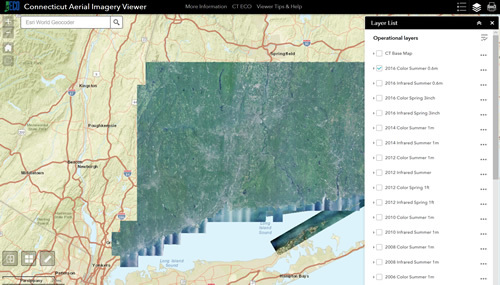 The Connecticut Aerial Photography Mosaics Map Mash-up also allows users to view imagery for a particular location as well as setting the default aerial photography layer to view. Details on creating a custom bookmark for this map mash-up are included below the interactive map.